Previously in Part 1 – we made most of the Northeast rethink their waterfowling life choices . . .
Full disclosure – I’ve never hunted New Mexico. In researching this project, we spoke with a number of NM natives who attested to the great waterfowling the state offers, albeit with a caveat surrounding the wet/dry cycle the state experiences. Still, lots of mature pintails, redheads, and mallards all come crashing down out west . . . I wanted to write this ranking with a Jersey accent, but I kept shifting into more of a Bahstahn type thing so I nixed that idea. New Jersey offers a surprising diversity of waterfowl species and hunts, from inland puddle hunts to divers along the coast and plenty of geese. This is a great place for a diver smackdown of redheads, scaup, Canvasbacks and of course the sea goose, Brant . . . Plenty of good waterfowl species in the Silvers State, including, surprisingly to us, some really good swan hunts. Vegas, gadwalls, teal, pintails and swans . . . what’s not to love? Indiana is a solid state for a waterfowler. Why does it come in at 37 on our rankings? Because it’s not the “best” at anything. A fair amount of land, good species diversity, no “star” ducks to speak of . . . Really good mallard and goose hunts on some of the farm land if you can get access . .
Delaware and Rhode Island both have legitimate beefs with our rankings, in that both states were (perhaps) unfairly penalized due to their small geographic footprint. Still a great location for geese, divers, and a fair smattering of puddlers. A place where waterfowling still feels like a Rockwell painting when you time it just right . . .
Can you kill any number of species in Georgia? Sure you can. Will you? I don’t think so. Great state for trophy wood ducks, as I believe these birds are as pretty in GA and Alabama as anywhere else (which is saying something for perhaps the prettiest bird of them all) . . . Add in some mallards and a few geese and you’ve got enough to get you out of bed on a chilly Saturday . . .
Pennsylvania is a sleeper state. No one thinks it has a shot at the championship, and it doesn’t, but the fact is it really holds its own with quality waterfowling. See Georgia, just closer to the Mississippi flyway. Beautiful woodies are not uncommon, some divers on the bigger lakes and Mobile Bay, and some fair puddler migrations, but the latter can be very weather dependent from year to year. Enough rivers and woodlands to offer a diversity in geography, as well as a few lakes dotting the landscape . . .
There’s some flooded timber offering decent mallard shoots, as well as some Gadwalls and quite a few good pockets of wood ducks. 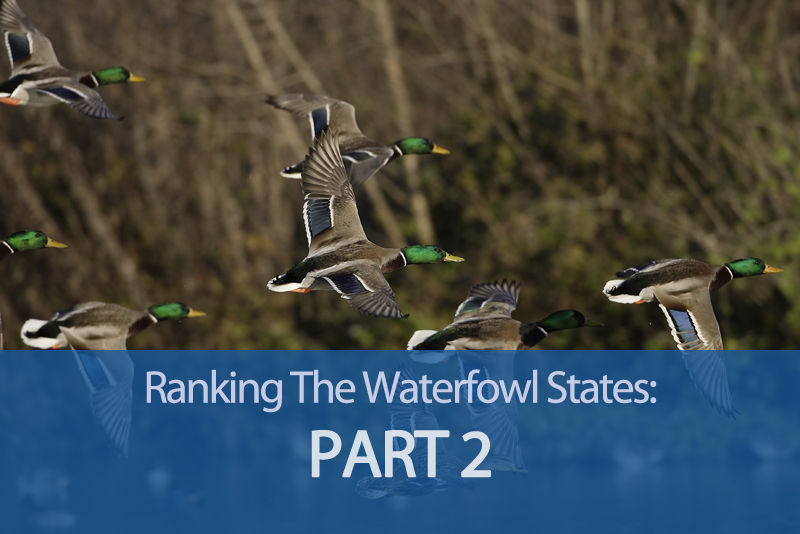 Add in the milder climate zone and you end up with a consistent, if not spectacular, waterfowl state . . .To continue on to the top 20 states click here.